At this time the family had three children. However, Kirsti, the youngest daughter, died of typhoid fever on 13th February 1900. Aino Sibelius became deeply depressed, and Jean Sibelius’s drinking changed from youthful celebrating into something more dangerous. However, it did not interfere with his work at this point. The atmosphere of melancholy is reflected in a rapidly composed piece, Fantasy for cello and piano, later called Malinconia. Another minor work was Sandels, which was awarded a prize in the composition contest of the choir Muntra Musikanter. Oskar Merikanto wrote: "This work comes nowhere near the best of Sibelius's works." In the spring, the most important task was the rewriting of the first symphony before the tour of Robert Kajanus's orchestra and performances of it at the world exhibition in Paris. Throughout the spring, both Sibelius and Kajanus received letters of good advice from a mysterious figure writing under the pseudonym "Music lover". Behind the pseudonym was Baron Axel Carpelan, who soon became one of Sibelius's foremost friends and supporters. Sibelius went on the tour also, although Kajanus did not let him conduct. The emphasis was on Sibelius's orchestral works: the first symphony and Finlandia and, in the second programme, Lemminkäinen’s Return, The Swan of Tuonela and parts of the suite King Christian II. The orchestra also performed works by Kajanus and Armas Järnefelt and folk song adaptations. Robert Kajanus and his orchestra rehearsing in the premises of the Fire Brigade before the European tour of 1900. There were nineteen concerts in thirteen different cities, and the grand tour marked the beginning of Sibelius's international breakthrough. The Swedish critics praised the first symphony as "extremely remarkable", and in Copenhagen Charles Kjeruf of the newspaper Politiken praised the "shamelessly bold and thoroughly independent music". In Hamburg, Ferdinand Pfol of Hamburger Nachrichten wrote about "a great artist whose imagination has the wings of an eagle". Berlin was the most important venue of the tour, and the critics in Sibelius's former student city showed great interest. Otto Taubman of the Berliner Börsen-Courier enjoyed the composer's "new and unusual" musical language and admired the "stormy" enthusiasm of the large audience. According to Berliner Fremdenblatt, Sibelius was a composer of great talent, someone who knew how to express his elegiac feelings and pathos, but who went to extremes in his bursts of passion. The critic of Berliner Lokal Anzeiger called Sibelius a "formidable talent". The concerts in Berlin marked a breakthrough for Sibelius in the critic circles of Germany. After this, the slightly more modest success in Paris was easy to endure. The concert season had ended and the most important French critics were already on holiday. Sibelius returned home satisfied, but at home in Kerava the fate of his daughter Kirsti could not be forgotten. Sibelius gratefully accepted the travel funding that Axel Carpelan had arranged. According to Carpelan, Sibelius's musical expression was in need of classical Mediterranean lightness. He procured 5,000 marks (about 17,000 euros in today’s money) for the composer's trip to Italy. Sibelius used part of the sum to reduce his debts before the journey. The family left for Berlin at the end of October 1900 and stayed there for several months, up to the end of January. Carpelan became anxious – after all, Sibelius was supposed to be travelling to Italy! By January 1901 all the money had been squandered. In her notebook, Aino Sibelius commented on the foolishness of wasting so much money. Sibelius borrowed extra funds from Finland and the family finally travelled to the Italian town of Rapallo on the Mediterranean coast. In Rapallo, the composer conceived ideas for the slow movement of his second symphony. On the margins of his drafts he made notes on the meeting between Death and Don Juan, i.e. the principal character in Mozart's opera Don Giovanni. However, his daughter Ruth became seriously ill in Rapallo, and the family feared that they would lose yet another daughter. Finally, she recovered from peritonitis and a fever of over 40°C. The composer left the family while she was convalescing and travelled to Rome. His sketchbook was brimming with themes for the years to come: Rome saw the first sketches for the works Pohjola’s Daughter and Night Ride and Sunrise. Sibelius returned from Rome and took his family to Florence to admire the art in the Uffizi Gallery. They returned home in May 1901, but a new trip was immediately awaiting Sibelius. He had been invited to conduct his music at the music festival of the Allgemeiner Deutscher Musikverein in Heidelberg at the beginning of June. The programme included The Swan of Tuonela and Lemminkäinen’s Return. The concert confirmed influential German musical figures in their enthusiasm for Sibelius. Berliner Tageblatt called The Swan of Tuonela "a sensitively designed colour sketch". Lemminkäinen’s Return was described as "a work of true genius with surprising effects of timbre" and said to be "brilliantly successful also from a formal point of view". The success created a demand for the scores. During the next concert season, Felix Weingartner performed the same works in Berlin and Henry Wood conducted the music for King Christian II in London. Other conductors, too, added works by Sibelius to their repertoire. The autumn of 1901 was taken up with the composition of the second symphony, as was the beginning of 1902. Its first public performance in Helsinki on 8th March 1902 was one of the most consummate triumphs of Sibelius's career. The Finnish people, who had been disheartened by years of oppression, were encouraged by the heroic second symphony, which they saw as imbued with a patriotic spirit. Oskar Merikanto wrote in Päivälehti that the work was a masterpiece which exceeded "even the boldest expectations". Evert Katila in Uusi Suometar compared the symphony to a broad river flowing majestically to the sea. In Karl Flodin’s opinion, the work was "an absolute masterpiece, one of the few symphonic creations of our time that point in the same direction as the symphonies of Beethoven". In the spring, Sibelius completed The Origin of Fire for the inauguration of The National Theatre in April. This work for baritone, choir and orchestra lasting just under ten minutes was an expression of Sibelius's continued interest in Kalevala. The text could again be interpreted as protest-minded: the Finns were lighting a fire in the midst of the darkness of Russian oppression. The first public performance on 9th April 1902 was overshadowed by other works in the long programme. 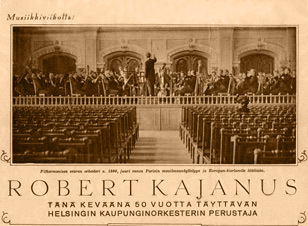 Päivälehti published the lyrics of the work the following day, commenting only, "The work is excellent and had a powerful effect on the audience." But Sibelius understood the value of the work and revised it eight years later. In the summer, Sibelius spent time in Berlin with his brother, and also at Tvärminne near the town of Hanko. At Tvärminne he worked at the song Var det en dröm (Was it a Dream) and the new version of En Saga. In the autumn, the family moved back to Helsinki after the years in Kerava. At the invitation of Ferruccio Busoni, Sibelius conducted the new version of En Saga in Berlin in November 1902, at a concert of the Berlin Philharmonic. The concert marked Sibelius's final breakthrough in Germany. The score of the first symphony was published, and Emil Krause spoke highly of the work in Hamburger Fremdenblatt. However, Sibelius was heading for a crisis. The move from Kerava to the centre of Helsinki prompted him to spend evenings on alcoholic binges.